So we managed to get a little bit further with the extension this week. 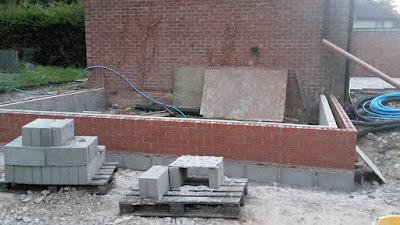 Dill, my bricklayer, came for a few days and managed to get the brickwork up to Damp course and start laying some slabs on our patio. The first day we spent a few hours making sure we'd accurately set it out. To help keep costs low I made sure that all the materials he needed were close to hand and I'd already made the "goal posts" that bricklayers use for setting out buildings. 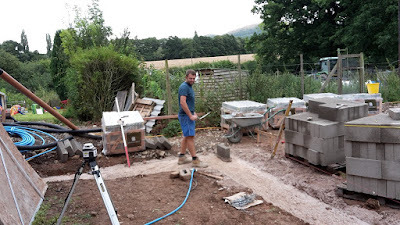 Now I've got the task of getting the drainage in place before filling the internal with the right layers of stone, insulation and then concrete. That means lots of work before he comes back! Great work. I was the hod carrier for my builder. Every night I'd lay out his requirements for the next day. It kept costs down tremendously. 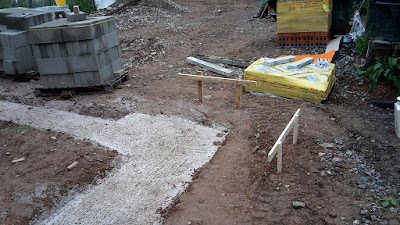 Its good that it is completely separate at the moment so all the mess,is out of the main house.but when you cut through for access......the pain starts.